Two years after the death of his music-writer father, Believe in Me protagonist Tim Green sets off on an obsessive quest through Los Angeles’ rock and roll underworld to track down the mother who deserted him almost three decades before—a quest he hasn’t mentioned to his mercurial new boss Blake Saunders, who’s just hired Tim to pen a biography of his floundering, past-their-prime arena rock band Empire. As Tim delves into the band’s tangled history and troubled present, he bonds with Saunders’ teenaged son Mal—newly installed as Empire’s lead singer—and daughter Jane, all the while working behind the scenes to retrace his mother’s footsteps through the years and cities and clubs. As momentum builds toward a cathartic confrontation, Never Break the Chain reveals itself as a story about families—the ones we’re born into, and the ones we create. 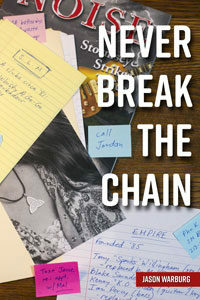 As with Believe in Me, the story at the center of Never Break the Chain is not just influenced by but infused with the music that forms the riffs and melodies of the characters’ lives, from Bob Seger to Otis Redding to the Black Keys, Al Green to Pink Floyd to the immortal Fleetwood Mac. One part family drama, one part mystery/thriller, and one part peek behind the curtain of an aging rock band, Never Break the Chain takes readers on a tension-filled ride driving toward a major turning point in Tim Green’s life, ultimately delivering answers to two essential, indelible questions: what makes a family? And who is Tim Green?